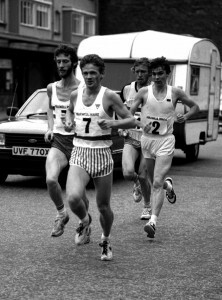 The running career of Colin Youngson exemplifies the golden age of Scottish road running like no other. Mainly in the 70’s and 80’s it just about made it to the 1990’s. 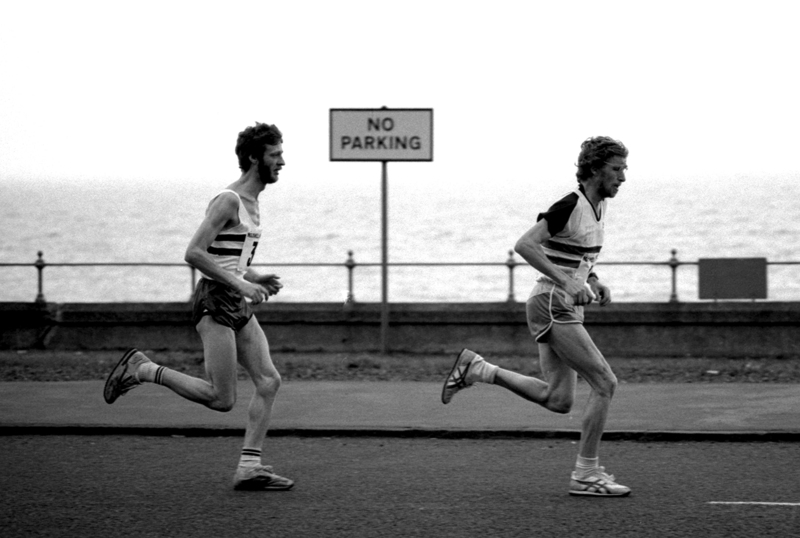 The work of Dunky Wright and Jimmy Scott in the Scottish Marathon Club had got the SAAA Marathon championship firmly installed on the big stage of the national championships, and the growing and thriving road running scene made for the best road relay of them all, the eight-stage Edinburgh to Glasgow. Every road runner of note took part in them both but Colin revelled in them. Ten medals in the Scottish marathon championship along with 7 golds in thirty appearances in the E-G. Quite remarkable. Like many other Scottish road runners, Colin joined the Road Runners Club. Joining in 1968 he is still a member which in itself is testament to how much he loves the sport: he has wrote an article for their magazine and it was published in early 2016 under the title ‘What Did The RRC Ever Do For The Scots?’. We could start his profile by looking at his replies to the questionnaire. OCCUPATION: Retired Teacher of English. HOW DID YOU GET INVOLVED IN THE SPORT? Although I was a poor sprinter at Primary School, I was aware that I had some stamina, and knew that my father had been a miler. At 15 I ran just over 5 minutes for the mile in the Aberdeen Grammar School Sports, then won the mile in S5 and S6 with a best time of 4:35. I was ninth in the Scottish Schools cross-country (well behind the winner, my very good friend Innis Mitchell and fourth in the Mile. At Aberdeen Uni I improved gradually, especially once Donald Ritchie (the future ultra star) arrived. He usually beat me on the country but I was better on the road. We both aspired to finish less far behind the brilliant runners from Edinburgh University. I was one of dozens of good Aberdeen runners who were inspired by the sarcastic, irascible but charismatic marathon runner Alastair Wood. Sunday runs were merciless and challenging. Ally and Steve Taylor were still very hard to beat when they were veterans! Once I started teaching in 1971, the talented tough guys of Vicky Park (including Pat Maclagan and Alastair Johnston) helped me to train harder and make progress. By the time I went to Sweden for ten months (1973-74) I was capable of training consistently well on my own. I reached my peak after I moved to Edinburgh (1974-81), and settled to 80 miles per week, including a long Sunday run and two repetition sessions with a number of very fit guys like Martin Craven, Sandy Keith, Fergus Murray, Alistair Blamire and (for a while, before he got far too fast) Allister Hutton. Then after I returned to Aberdeen we had a very good group, led by Fraser Clyne and Graham Laing. Metro Aberdeen was a particularly sociable club and the midweek ten mile runs were always competitive. Now I have retired, I am no longer capable of training with others without getting injured but Forres Harriers are very friendly and also successful (without my help). All my clubs have been excellent. Although this is certainly an individual sport, I always tried to be a reliable, consistent, valuable club runner, especially in road relays. WHAT EXACTLY DID YOU GET OUT OF THE SPORT? Self-respect. Opportunities to explore potential and achieve many targets. Daily outdoor exercise, fitness and health. Rivals who became friends. A lifelong interest in a great sport. 1975: Scottish Marathon win in a championship record of 2.16.50; record on Stage 1 of the E to G.
1992: first Scot to win an individual category (M45) in the annual Veterans 5 Nations CC International. Nothing too dreadful. Plenty of disappointing runs, inevitably. You learn to get over it and move on. WHAT AMBITIONS DO YOU HAVE THAT WERE UNFULFILLED? Never made the team for a major games, due to peaking in the wrong year, injury caused by over-training, the absence of physio support and lack of world-class physical talent. At my best, certainly worth a Commonwealth Games place, but never mind, since I enjoyed several successful international performances in different age-groups. WHAT DID YOU DO AWAY FROM RUNNING TO RELAX? Reading, writing, film, television, music, hill-walking, cycling, drinking good beer in great pubs all over Europe. WHAT DID RUNNING BRING YOU THAT YOU WOULD NOT HAVE WANTED TO MISS? A few days when it felt like I could run fast, almost for ever. The intensity of racing and hard training. Satisfaction from a good result (managing to give maximum effort). Running marathons in many countries. Winning international vests. The friendship of fellow runners. At university, 40 miles per week. At my peak, averaging 60 odd over the year but when building up to a marathon, six weeks of 80, including a weekly long run (16-25 miles), two or three rep sessions, plus recovery mileage, followed by two weeks tapering. As a younger veteran, 50-60, with the speedwork mainly fartlek. As an older veteran (age 60 plus), maybe 30-40 and only one run per day, from 3 miles to 10 miles in length. Nowadays a major aim is to get out every day but to avoid injury as much as possible. If you have a look at Colin’s list of achievements on the Career Highlights page you will have an idea of what a marvellous career in the sport he has had/is having. From 800m to 10 Miles on the track, Cross Country on all sorts of surfaces, hill and point to point running (the Lairig Ghru) and maybe particularly the roads where he has excelled in short stage relays and on up to the 45 miles of the Edinburgh to Glasgow straight through. If they ever resurrect the Trans America Foot Race, don’t bet against him. 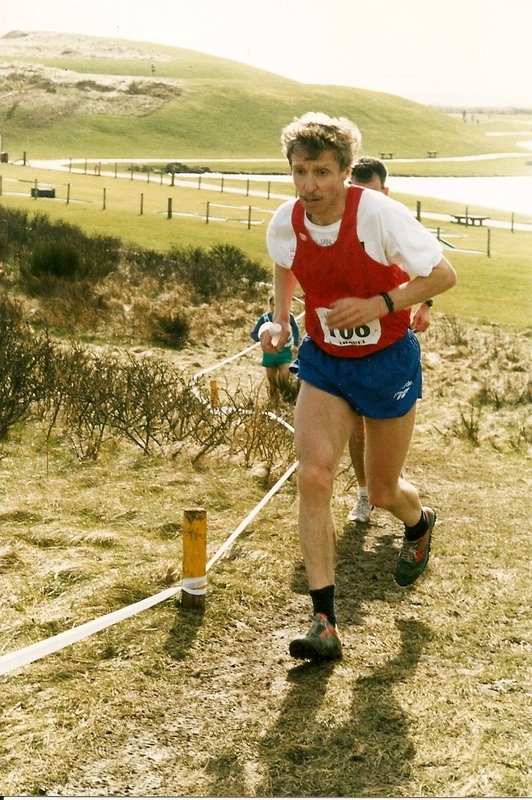 The photograph above was taken at Irvine when he was winning the British Vets M45 Cross Country Championship in March 1995. As I said above, Colin’s career exemplifies the zenith of Scottish road running like no other, with the possible exception of Donald Macgregor. The Scottish road running scene had been developed over the years since the war by Dunky Wright , Jimmy Scott and their committee members at the the Scottish Marathon Club to a point at which SAAA Marathon Championship had been given a place in the national track and field championships – road running’s highest trophy and it was held on the biggest stage in the land. The runners loved it. In addition the Edinburgh to Glasgow eight stage relay had been building since the days of the fifties when Bannon, Binnie and company plied their trade. 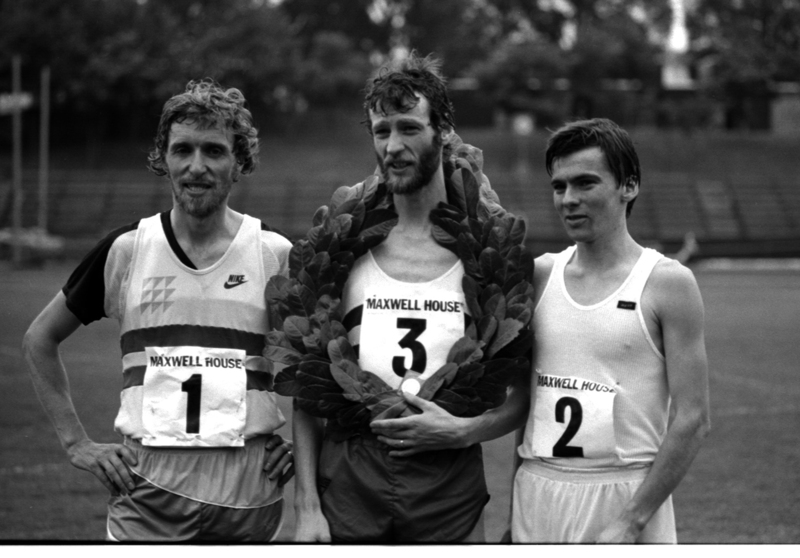 Colin ran in 30 Edinburgh to Glasgow Relays and won no fewer than ten medals in the SAAA marathon championships, four of them gold. a total of 40 (FORTY!) run sub 2:30 and nine of those sub 2:20 is some record and one of which he can be justly very proud. He ran in all sorts of road races – the Edinburgh to Glasgow straight through for instance – and at venues all over Britain and the continent with a foray across the Atlantic. The details are at the link above to his career highlights. But should any sports historian be contemplating a review of the road running scene they should start with his career. It is a picture of a successful and outstanding career in road running in the Edinburgh to Glasgow Relay and the marathon. 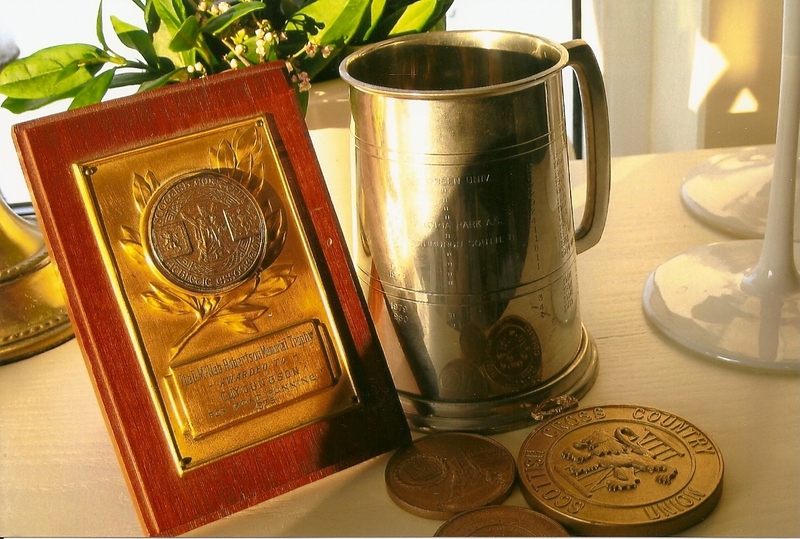 The tankard was presented to him after he completed his thirtieth E-G and every race is listed on it, the medals are representative – they are all gold and in two different styles. If you would like his comments on his career in the Edinburgh to Glasgow Relay, go here . The smaller ones are the original type of medal which had a relief picture representing each of the two cities on it – the bigger and shinier one was the later version. The plaque is the Donald McNab Robertson Trophy when he was the Scottish Road Runner of the Year in 1975. If you want a closer look, click on the wee thumbnail at the bottom. The link to his E-G career is above and the marathon record for Scottish Championships only is below: if you want his complete marathon running record for over 50 races plus some ultras then go here. David Carter profiles Colin Youngson who became eligible for veteran competition on his 40th birthday in October. Colin is also a talented fiction writer and from next month ‘Scotland’s Runner’ will be serialising two of his entertaining short stories. Marathons are made of milestones and Colin Youngson has just passed two. This year’s Aberdeen Marathon was his 50th and in October he turned 40. The veteran world is going to notice the difference. The record so far is impressive – and consistent. He has 10 medals from the SAAA Marathon between 1972 and 1985 (he missed 1976) – three gold, three silver and four bronze, including a championship record and a personal best in 1974 of 2:16:50. He has been an ever present in the Edinburgh – Glasgow Relay (apart from 1973 when he was in Sweden) with some memorable (winning) tussles over the last lap. He still holds the fastest time for the first leg which has stood since 1975. In 1980 he ran the London to Brighton (54 miles), hitting the wall at 40 but still finishing respectably. ‘Interestingly,’ he says, ‘I recovered more quickly from that than many marathons. The marathon, at speed, is hard. It’s speed that does it. All those guys that do four hour marathons should forget it. They should do 10K’s and half marathons and then they could look at a marathon and do a half decent time.’ Yet marathons are clearly in Colin’s blood. I was interested in the remark that he ran his first marathon (2:41) at the age of 21. Why was that? Inevitably, for distance runners from the north east, the name that cropped up was that of Alastair Wood. Was he a coach then? A mentor? A guru? ‘Not really. The attempt to gain his respect was the spur. He’s mellowed now but by God he was cantankerous then. Witty, satirical, challenging. If things are getting really crazy in the marathon I’ll just step off the track. It was a good lesson learned and since then he has settled into a basic 60 miles a week (with increases for particular marathons) with maybe six serious races a year. It means that he is more or less as fit, fresh and resilient as he was at 21. His first race as a vet will,he hopes, be the Scottish Vets Cross Country in January. The Boston Marathon in April is the next possibility. He realises that an invitation is unlikely but the prospect of a $5000 prize for first vet is tempting. ‘I’ve got to be pretty fit,’ he says, ‘to put my own money down on that one.’ Then there’s the British vets, European vets and many more. Will he approach races differently? He has himself pretty well summed up there. And when you add to that determination his experience and his competitiveness, you have a formidable runner. Colin Youngson has a promising future. Colin’s Dad was a runner and a source of great inspiration to him. Colin did what all of us should do and researched for himself his Dad’s sporting history. It is a warm-hearted and also inspiring story and can be reached from here The trophies in the picture are also part of the testament. But, to conclude, if we turn the focus back on Colin we should point out that he has since that article all those years ago had a lot of success as a veteran athlete too: he was won many Scottish Masters Medals and – for now – six British Masters titles at distances between 3000m and the marathon! And he’s not finished yet ……….